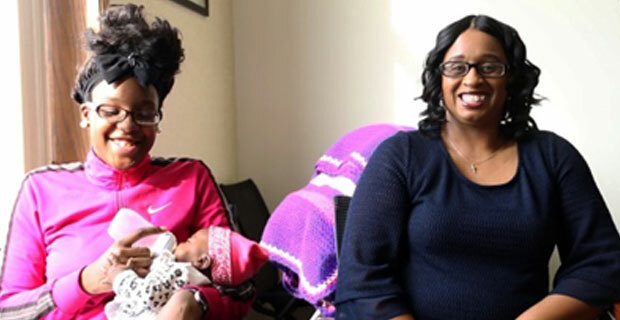 Tajanae, 19, describes how she plans to use her nursing degree as she feeds her newborn daughter, while 17-year-old Adrienne changes into her work uniform and talks about her career goals. Neither girl had imagined planning their lives this way – until their probation officers referred them to the Youth Futures program, which helps youth ages 16-21 involved in the juvenile justice system to finish their education and find work. Tajanae discovered she was pregnant shortly after her orientation, so she received help with child care and parenting classes in addition to job readiness training, tutoring, college enrollment and scholarships. Now she is a sophomore at Kennedy-King College, where she majors in nursing, and says she is working hard to give herself and her daughter a good life. “If I weren’t in Youth Futures, I’d probably be violating probation, doing the same things,” she says. Adrienne relies on her case manager, LaTosha Barnes, to help her take a breath and find more constructive solutions to her problems after receiving probation for a battery charge. “I’m learning to control my anger,” she says. “We really try to help the youth understand that as a young person in the juvenile justice system you have to go above and beyond to make sure that you are not getting in trouble,” Gernell says, noting that even 50-year-olds can have trouble finding employment due to a felony conviction when they were 19 or 20. But staying out of trouble can be much harder than people outside of Englewood may realize, Angela says: Poverty is a huge barrier to teens faced with choosing between a minimum-wage job and bringing home more money to their families selling drugs. Violence is another huge problem, Angela adds – some youth have never left the neighborhood because of gang problems. Angela says the Youth Futures team goes above and beyond to help their clients address their problems, and it shows in the program’s outcomes. So far, 94% of clients 17 and younger have stayed in school for at least a year – and 100% of clients are in school or a placement at the three-month follow-up. The funding organization is impressed, and has asked Metropolitan’s Youth Futures staff to take on more clients. 94% of clients 17 and younger have stayed in school for at least a year. 100% of clients are in school or a placement at the three-month follow-up.